Both Nicks and EB&W (Hotrods) have received special services awards at the AGM and are now on the honour board. Well done Mike and Martin (Hotrod) and apologies to London Dave who posted this first in the AGM thread, (and Magpie Bat who hit it on Twitter) I just thought it deserved it's own thread. So what the Site Get's with this Award? They get their names on the honour board at the club. None necessary, good to see it get a thread. Congratulations to Mike and Martin, and to the good people of Nick's and EB&W. Congratulations Mike....lovely catching up with you and Nick again....Well done!! Well done, congrats. Officially part of club history. "With us or against us, simple"
The Macedonian Marvel = The Croat Confoundment!!! WELLLINGHAM ROVES IT....AND KICKS THE GOAL!!!! SWAN'S GOING TO KICK A GOAL. THEY'RE HOME YOU'D THINK I KNOW IT'S A LONG WAY TO GO BUT THEY'RE KILLING THEM NOW!! I had the opportunity to witness the presentation and introduce myself to both Mike and Nick after the conclusion of the AGM. Great people and it is fantastic to see their contribution recognised by the club. Good stuff. Congratulations Mike and Nick. Love us or Hate us... we are Collingwood - you can't ignore the Mighty Magpies!!! Congratulations to everyone involved in the establishment and ongoing administration of Nick's !! Eddie was on the phone a couple of weeks ago, "I want you to come to the AGM, we're going to give you an award; it's the Special Services Award, the second highest award the Club can bestow... and bring Nick with you." That's how it happens with Eddie, you pick up the phone and he says "Mike! Eddie here" as if we'd been speaking yesterday. I reminded him that it has been twelve years, thereabouts, since we'd last spoken - made no difference. Anyway, the upshot was that Nick and I were off to the AGM and mum's the word. The AGM was like every other AGM I've been to: minutes were read, motions were put and carried, new board members introduced, but there was a significant difference, this was the Collingwood AGM and Eddie was in the chair and in fine form. The attendees were significantly different as well. Bucks was sitting in the row behind us with the new team members - who he duly introduced, the leadership group was there headed by Pendles and Nick Maxwell and Alan Didak were there to be presented with their life memberships. With legends Dr Jack Kennedy and Eddie Hillgrove also in attendance it was obviously not going to be the one of the mundane and tedious AGMs that I normally attend. As I've said above and has already been posted I was there to accept a Special Services Award. My name is not on the award and I doubt that it will be on an honour board. 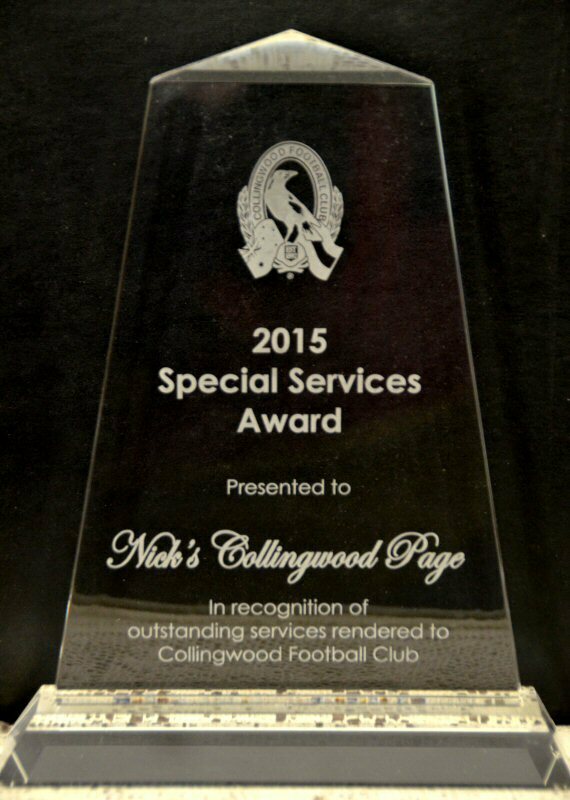 The name on the award is 'Nick's Collingwood Page' and that is fitting as the award has really been earned by the Nick's community and in particular by those involved in its ongoing survival. I am no longer active in the day to day running of the site my role now is as a facilitator and as tech support, the leadership group has taken over the daily grind and that is as it should be: 'Side by Side' the community runs the show. In 2004 MagpieMad took on the huge responsibility of the redesign and ongoing management of the overall web site (except the bulletin board) and by spending countless, seemingly thankless hours has created and maintained a superbly creative and highly professional site... and it's not a small web site. He, as the webmaster, and the team that he puts together are responsible for the framework that holds all of this, including the bulletin board, together. The moderation team led by WhyPhilWhy?, London Dave and Donny have run the bulletin board and have hands-on managed that facility on a daily basis since about 2002, that's a long time and those three have been there for all of it. Other moderators have come and gone in that time and they've all played their part in keeping this community active and relevant as part of that team. It's not only a thankless task, but they sometimes also cop abuse for doing it, but I know their dedication is appreciated by the vast majority as this facility could not exist without them. We have also managed to contribute to the Club by sponsoring a young and upcoming player each year thanks only to the dedication and persistance of MargOZ and the contributions of those who she's managed to inspire. And the volunteers who have managed the first, and therefore the oldest, live scoreboard in this country, have written content for the site and have contributed countless other bits and pieces to keep this show on the road. And there are the ones that help with the ongoing cost. There is even one member here who contributes $5 a month every month to help keep us afloat and has done for years. All of these people are the reason that Eddie rang me up. I originally created this site from Nick's beginnings so it was fitting that I accept the award on behalf of the Nick's Collingwood community, but it should always be remembered that without the community involvement there wouldn't now be a web site or an award, so this award is for all of us. It was wonderful meeting Frankie again after all these years. I still have the original Cheer Squad flag on the wall of my office that she sent me after it was retired god knows how long ago - probably 12 or 15 years. And thank you JBJ and Member 7167 for making the effort to say hello and to make Nick and me feel so welcome. All in all a great evening! Congrats to Mike and Nick. Well done guys. That is terrific recognition and a wonderful achievement. Well deserved. Congrats.